Use Google’s URL builder to generate a landing page URL with tracking parameters. In the builder enter the URL of your chosen landing page where it says “Website URL”. 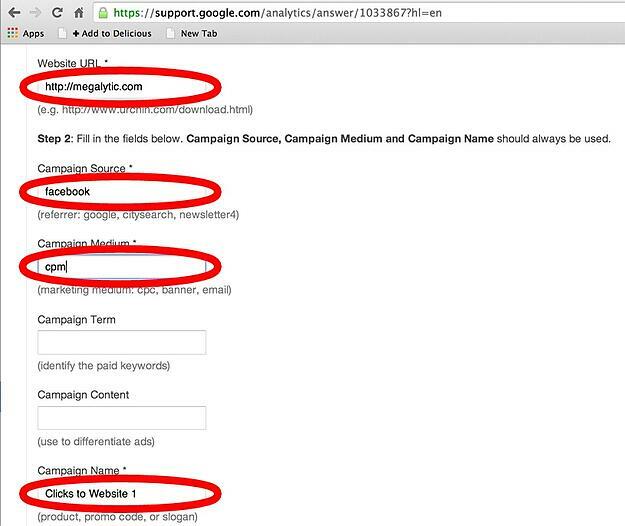 Name “Facebook” as the “Campaign Source”. That’s the short version. But for a step by step guide and some insights into common problems, read on. Google does a pretty good job of explaining how they use URL parameters to identify and classify referral traffic. But essentially, When a Facebook user clicks on a link that has been tagged in this way, those parameters are detected by Google Analytics and used to correctly classify the traffic as coming from Facebook. Google’s Campaign URL builder is a convenient way to help you construct a tagged link to your landing page, so you never have to worry about what parameters it should have. Here is the detailed process, with screenshots that you can use to create a Facebook ad which is correctly tagged for tracking in Google Analytics. First, open your Facebook Ads Manager and click Create Ad as you normally would. For this example, let's assume that you want to optimize for clicks to your website. So, select that option from Facebook. 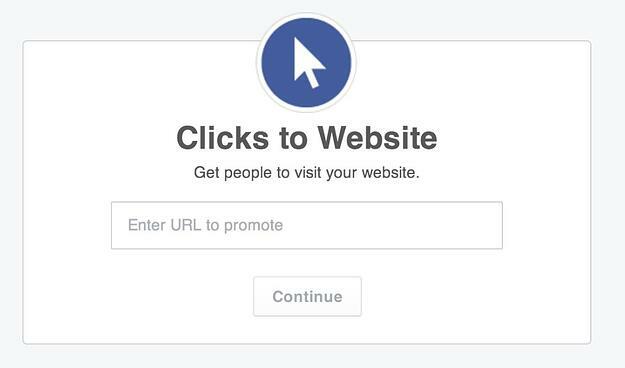 Now, Facebook asks you to enter the URL of the landing page where ad clicks should send the visitor. If you haven’t already created your parameter based landing page URL at this point head over to the Google Campaign URL Builder and fill out the form to add tagging to your landing page. As we said earlier, this is the place where you will enter your landing page URL where it says “Website URL”. Then identify “facebook” as the “Campaign Source”. In this case, I’m using “cpm” as the “Campaign Medium” because Facebook is going to charge me for impressions, not just clicks. But if this were a pay-per-click campaign, I would use “ppc” instead. Lastly, give your campaign a name where it says “Campaign Name”. When you click "Submit", Google will give you an enhanced landing page URL with the parameters properly added for accurate classification by Google Analytics. This is the URL that you enter into the Facebook ad builder when prompted to "Enter URL to promote". Now, complete the creation of your Facebook ad as you normally would. Start the campaign, and observe what happens in Google Analytics. After a few hours, check your Google Analytics. You should start seeing traffic from Facebook classified as "facebook/cpm" or "facebook/ppc". 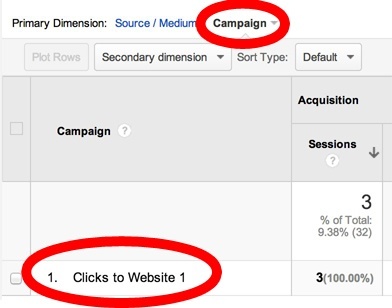 Now, if you click through on the "facebook/cpm" row in Google Analytics, you can see the campaign information that you entered in the Google URL builder. Make sure that you select "Campaign" as the Primary Dimension in the Google Analytics report. This will show you the name of your campaign. As you can see below, it shows clicks coming from the "Clicks to Website 1" campaign - which is what we entered into the Google URL builder. What if Your Facebook Traffic isn’t Showing Up? If you skipped the parameter generation, your Facebook traffic could be getting classified incorrectly in analytics. A client of mine recently ran some Facebook ads and was perplexed that there was no big bump in their referral traffic from Facebook. Here's a screenshot showing a typical day during the campaign. 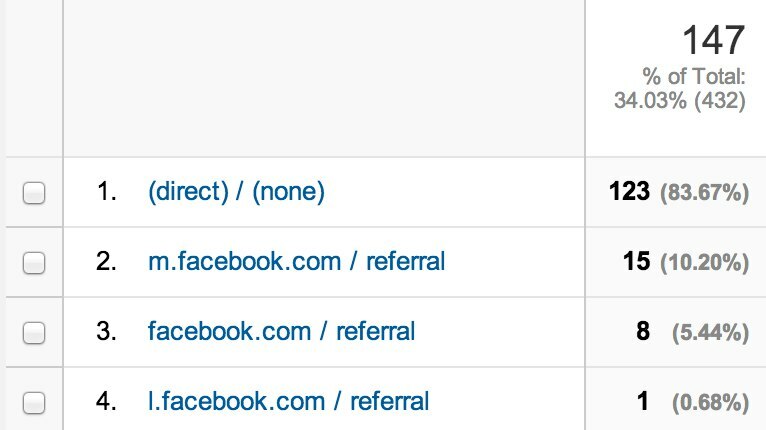 Referral traffic from Facebook shows up as m.facebook.com (mobile), facebook.com (desktop) and l.facebook.com (link shim traffic from FB). The 24 sessions shown here were much less than expected. However, this client was seeing a big bump in their direct traffic. A typical day would have 10-15 direct, but here they were seeing 123. The problem was that Google Analytics was classifying a lot of the Facebook advertising traffic as direct. In Google Analytics, direct traffic is traffic for which a referrer wasn’t specified. GA gets the referral information from the HTTP header. However, if the HTTP header does not include a referrer field, then GA cannot figure out where the request is coming from. 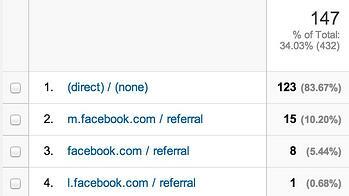 For many reasons, traffic from Facebook ads often do not include a referrer, and that causes GA to classify the traffic as direct. So, in order to accurately classify traffic coming from Facebook, you need to take a different approach. It’s relatively easy to properly track traffic from a Facebook campaign, there are just a few extra measures that will help you get better more accurate data and avoid the misclassification of traffic.